Summary: With over 100 years in the industry, Hammer offers serious (and German certified) quality with the Crosstech XTR cross trainer. The machine is programmable, particularly quiet and the sturdy design ensures durability for years to come. Excellent user feedback for this model too, see the product page at amazon.co.uk for the complete spec and picture gallery. The Hammer Crosstech XTR is a cross trainer that is suitable for workout enthusiasts at all levels of fitness. The machine comes in both black and white and with a heavier than usual 16kg magnetic flywheel and a 3 piece crank made from heavy gauge steel, you are assured the ultimate smoothness while training. This item, in the medium price range, has been certified to German quality standards, ensuring sturdy construction, while you’ll also receive a 2 year warranty on all parts. This cross trainer is fully programmable, with 12 load profiles and four programs linked to your pulse rate – this measured through the pulse rate sensors in the hand bars or through the built-in chest strap pulse sensor receiver (you’ll need to purchase the chest strap separately). There are also 16 computer controlled resistance levels , while a quick start feature is also in place, for those speedy workouts. The very impressive LCD display shows the time, the speed, the revolutions per minute and calorie consumption. The machine is easily portable due to the transport wheels built into the front stabilizer, while the 21cm non-slip adjustable footplates ensure stability throughout your workout. The trainer is powered by your mains supply, so you’ll have no worries with changing batteries on a regular basis and is suitable for all users up to 130kg (20.5 stones). You’ll pay a little more for this item than you might for similar cross trainers, this due to the high quality of the item. Reviews of the Hammer cross trainer are mostly positive. Assembly was said to be very straightforward with very clear and easy instructions and once built, the majority of users state that it appears particularly stable and robust, although one user complained that it wasn’t as stable if ‘you really go for it’. The variety of the programs was praised as were the ‘extremely quiet’ noise levels. As usual the overall score of this lower-mid range machine is bought down by someone expecting a commercial gym level trainer for their money (complaining that it is small! )… there are several of these types of comment in just about every piece of fitness equipment out there, so I would reserve judgement there. The Hammer Crosstech XTR is a solid and versatile piece of equipment. The range of programs ensures that the cross trainer will continue to challenge as your fitness levels increase, while you are promised a smooth ride due to the 16kg flywheel and the precisely engineered heavy gauge steel design. Check it out for yourself at amazon.co.uk! 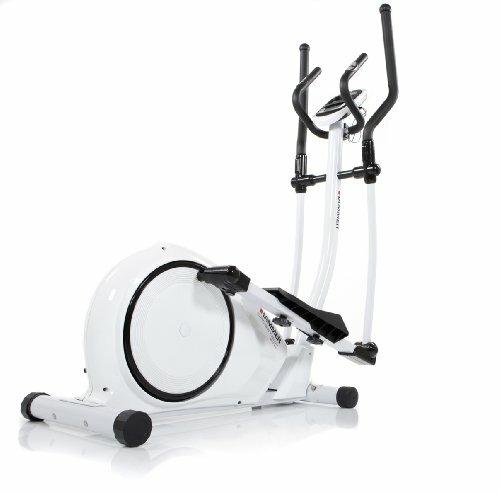 Check out this main page for more Elliptical Cross Trainer Reviews!